My friends, Marcus Mariota has officially declared for the 2015 NFL Draft. Marcus, what you did for this team, school, fan base and even state has no boundaries. After watching our beloved Ducks fall to Auburn in the 2010-11 season, many fans wondered when Oregon would ever see that level of success again. Well you answered that call, and then some. Although there are so many options to choose from, here are the Top 5 moments of Mariota’s career at Oregon. 5. When did fans know he was for real? Arizona State, 10/18/2012. In just his fourth start against a Pac-12 opponent, a 5-1 ASU team, Mariota broke this one off to the house. 4. The 2013 Fiesta Bowl. After leading his team to an 11-1 record in his first year in a uniform, Mariota paced the Ducks to a 35-17 win over Heisman hopeful Collin Klein and K-State. 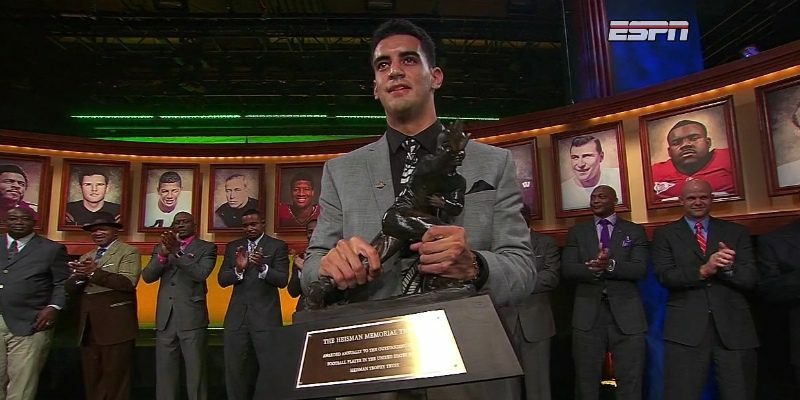 Mariota was awarded MVP honors after accounting for 228 yards of offense and three touchdowns. Here was the icing on the cake. 3. That One Play Against Arizona. Was it one of the best plays of his career? Most likely. Was it only amplified by the fact that it was on an enormous stage that guaranteed his team a shot to play in the first-ever College Football Playoff? Most definitely. 2. The third quarter (and first minute of the fourth) of the 2015 Rose Bowl. 80% completion rate, 181 yards passing, two throwing TDs, 23 yards rushing and another score. There is only one thing I can say about this: It could not have happened to a better guy. With that, I end my countdown. Time has run out for the Flyin’ Hawaiian here at the U of O, but he certainly will not leave our hearts any time soon. As a previous 3-star recruit, he came in to Oregon and, to quote fellow FishDuck.com writer Randy Morse ”spoke softly while carrying a big stick.” His humility, paired with his unquestionable leadership, created something special out here in lil’ old Eugene. For one final time: Mahalo Marcus, and Go Ducks.